Try this unique spice mix for pickling! 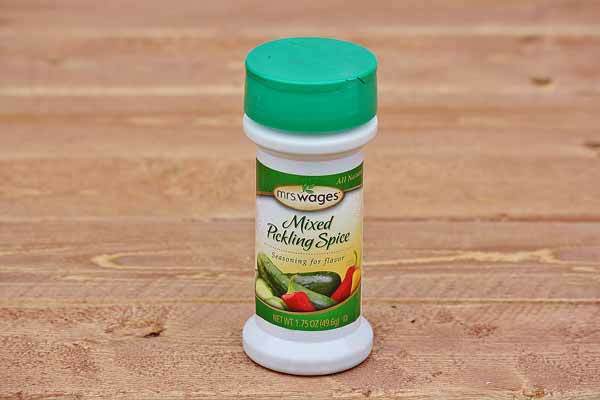 A special blend of choice spices originally used in Mrs. Wages Old South Cucumber Lime Pickle recipe, a favorite pickling recipe for over 25 years. Use this pickling mix for any homemade pickles and relishes. It even makes a good seasoning for vegetables, meats, and more! Made in the USA. Ingredients: Cinnamon, Allspice, Mustard Seed, Coriander, Bay Leaves, Ginger, Red Pepper, Cloves, Black Pepper, Mace, Cardamom.